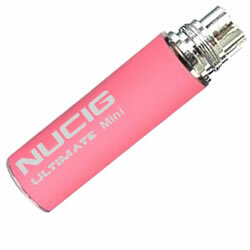 Electric cigarette mini pink ultimate battery. Buy UK NUCIG. Mini ULTIMATE rechargeable super power battery. Automatic on draw - as provided in the mini ultimate kit. Lasts for 3 hours continous use. Not compatible with the charger provided with its bigger brother the Ultimate Kit in which case a new USB charger will be required. absolutely love this product but it does seems to have a very short life. I don't charge it until the battery is looking to be charged, I charge it at my desk so I don't over charge it but still I only seem to get a couple of months out of it before it dies on me. However I will continue to buy it .... just wish it lasted longer. Great mini size, nice soft pink finiish which looks & feels great and actually lasts for a long time for its size. No fiddly buttons - just draw and be amazed.